features make the Catalyst 3524-PWR XL the premier switching solution for customers as they prepare their local-area networks (LAN) for integrated voice, video, and data applications. 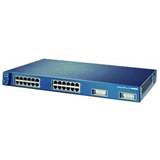 The Catalyst 3524-PWR XL switch has 24 10/100 switched ports with integrated inline power and two Gigabit Interface Converter (GBIC)-based Gigabit Ethernet ports. Integrated inline power provides DC current to devices that can accept power over traditional unshielded twisted pair (UTP) cabling(for example, the Cisco 7900 family of Cisco IP phones). The dual GBIC-based Gigabit Ethernet implementation provides customers with tremendous deployment flexibility - allowing customers to implement one type of stacking and uplink configuration today, while preserving the option to migrate that configuration in the future.